…tour. A BMW tour. You thought we bought a car? Not even close, but more about that later! For now, here we are in Munich, Germany and in some ways it is exactly what we expected–stores filled with lederhosen, BMWs cruising the streets, beer and sausages everywhere you turn. We even met some really cool guys from a German TV show. Weird, but cool. Really, what more could a girl ask for? Sure, we are in Munich one week after the end of its famous Oktoberfest, but it doesn’t matter. This is still a great city with lots for first time visitors like us to see and do. We got here before dawn yesterday, tired but ready to explore this new city. After storing our luggage (thank goodness for these services at every train station we’ve been to), we decided to walk toward the Deutches Museum. 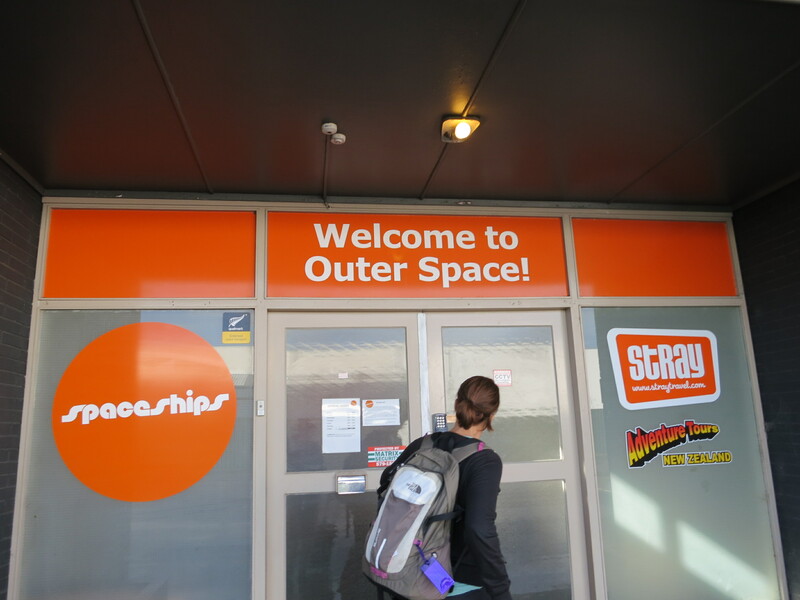 We’ve met several people who highly recommended this science and technology museum, so it seemed like a great way to spend our time while we waited to check into our room. This giant museum spans five floors and covers everything from microelectronics to aeronautics and the history of sailing in Germany. We especially loved seeing the cross section of an airplane which shows us just how little space is taken up by passengers and how much room there is for cargo. We also found the ethical questions regarding genetic testing really interesting–this was partly due to the creepy yet intriguing faces speaking to us from the wall. After pressing a button, they told of their dilemmas regarding genetic testing and then we voted if we agreed or disagreed with the choice. It was interesting to see how our opinion compared to others who had taken the survey before. While there were many exhibits that were interactive and innovative, the longer we were there, the sleepier I got. I found my eyelids getting very heavy as I read the information below each exhibit. While Phil wandered around in fascination, I kept looking for benches where I could rest my very weary body. At this point I realized I didn’t get quite as much sleep on the train as I imagined, and I needed to rest. At my request, we left the museum earlier than planned and checked into our room. We didn’t order this monstrosity! It belonged to the man next to us and he actually ate the entire thing (plus a salad beforehand). After a lovely, and very much needed nap, we ventured out for a late dinner. Excited that we are in Germany and it is finally acceptable to have a hamburger again, we chose Burger House based on the extremely positive reviews on TripAdvisor. This was our first foray onto the Munich public transportation system and after our ticket debacle in Budapest, we weren’t taking any chances. Like good citizens, we bought out tickets and validated them. We would not be burned again. It is a good thing we did all this because as soon as we got on the train a group of ticket control agents boarded and started checking tickets. Exhilaration rushed through us. We were pretty sure we did all that we needed to do, but it was our first time and we couldn’t be positive. When they checked our tickets, I wanted to shout, “Yeah, just try to say something to me!” They nodded and moved on. Never again will we be caught without the right ticket! Our good mood continued when we finally found Burger House. As soon as we walked in we were surrounded by the sights and sounds of an awesome restaurant. Not too big, maybe 12 tables in all, people drank beer and ate their food looking truly happy to be there. We were barely able to snag a seat at the bar, just eeking in before their 10pm closing time which seems early to us. I’m so glad we made it because this was easily the best burger we’ve had since we left New York. It is amazing what can happen when simple, fresh ingredients are prepared well. The man next to us ordered the Triple Classic Burger and actually finished it. Quite a feat. The burger, coupled with our first taste of delicious German beer, made for the perfect first dinner in Munich. Customers wait on the stairs to go down to their brand new BMW. What a thrill! This morning we woke up refreshed and ready to tackle the city head on. We tried to get tickets for a tour of the BMW plant, but they require 3 weeks notice. We didn’t even know we would be in Munich as of 3 weeks ago, so we figured we would just check out the museum and the BMW Welt. Phil has great nostalgia for BMW and today’s visit has only made it worse. Now I’m worried he’s going to go back to the U.S. and buy and old 3-Series. The BMW Welt is basically a giant showroom with current BMW and Rolls Royce (also part of BMW Motor Group) models. Admittedly, it was fun walking around and dreaming about which car we would buy. Even though they weren’t on display (and aren’t what most people think of when they think BMW), I think I’d go with a Mini-Cooper. They are so cute. I know I would look awesome cruising around in a red one. Before heading to the museum, we checked to see if there were any last minute openings on the tour and lucky for us, there were! We took a guided tour of the museum, the plant and the welt. This tour is incredibly comprehensive and is something we would definitely recommend to anyone visiting Munich. The museum is modern and shows the long history of BMW, from its days of making aircraft engines to making high performance cars and motorbikes. It would have been a great visit all on its own, but in addition we visited the plant. Here in Munich, they only make the 3-series and we got to see many steps of the process. From welding the body parts together, placing the body on the drive shaft and the process of painting the body, we saw so much more than we did when we visited the Mazda plant in Japan. In some ways, this was almost too much information and we were begging for a break or at least a stop at the restroom. When we didn’t get that, we figured we’d hang in through the last part, which was the welt. We weren’t expecting much, since we had already looked around earlier. What we didn’t see before was the floor upstairs where customers come to pick up their brand new BMW. 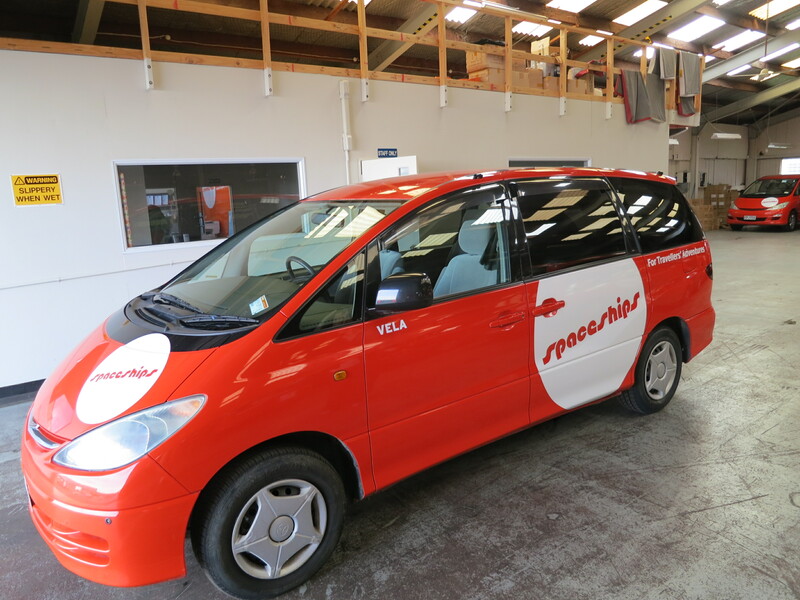 Each day people come here and are greeted with the car they have been waiting for. They come down a giant staircase and their car is spinning platform waiting for them. After having their photo snapped by a professional, they jump inside and learn the ins and outs of their new vehicle. It was really neat to watch. One car was even waiting with a big red bow. It took me a while to believe that this present wasn’t destined for me. What a great surprise that would have been. Upon leaving the BMW tour, the cold October rain began to settle in. We decided to take a break from being tourists and head back to the apartment where we are staying. We did manage to head back out for an awesome dinner at a local brewery, but we will tell you all about that tomorrow. Until then, go out and have a delicious German beer and some knockwurst and think of us here in Munich. A store selling primarily stylish lederhosen. Is this in fashion? We aren’t sure. Excuse me, could we please have a bigger bottle of mayonnaise? This won’t be enough. On the subway, the rider has to open the door using the handle or else it won’t open at all. Very old fashioned! A clay model at the BMW museum. Designers still use this technique to create new cars. Well, our time in New Zealand has just about wound down to a close. 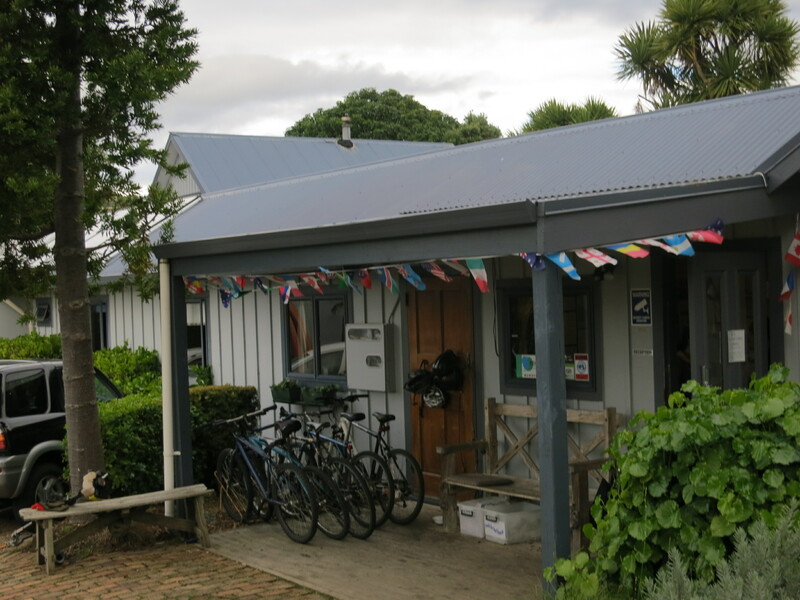 Last night, Brooke and I jetted about an hour north of Auckland to have dinner in Warkworth. 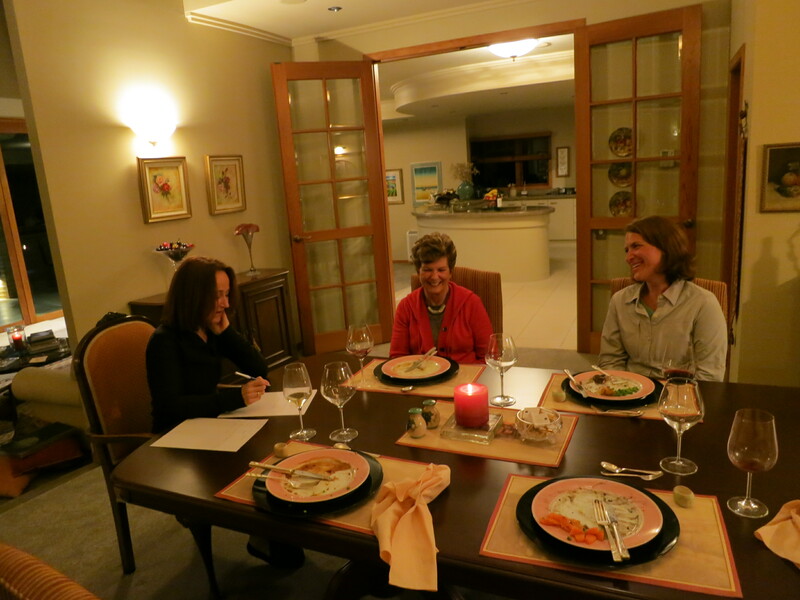 We dined with another set of new friends whom we had met when we first arrived in the country. Our last dinner in New Zealand was at an upscale pub where we finally had a chance to sample the fish ‘n chips we had been salivating over from town to town. Deliciousness followed. Driving back, we were greeted with the gorgeous site of the Auckland nighttime skyline welcoming us across the bay and into our final New Zealand hotel stay. I know I’ve said this a dozen times in a dozen posts, but it is a beautiful country. We leave New Zealand about a thousand times more knowledgable about the culture, people, geography and history than we were when our plane landed in here thirteen days ago. And we’re still learning new things. For one, it turns out that when a sheep gives birth, the result is always twins. Never just one baby lamb, but two. We’ve also determined that given the Kiwi bird’s propensity to sleep up to 20 hours a day, Brooke might actually be part Kiwi. (Note from Brooke: “At least I wish I was. At least then people wouldn’t judge. 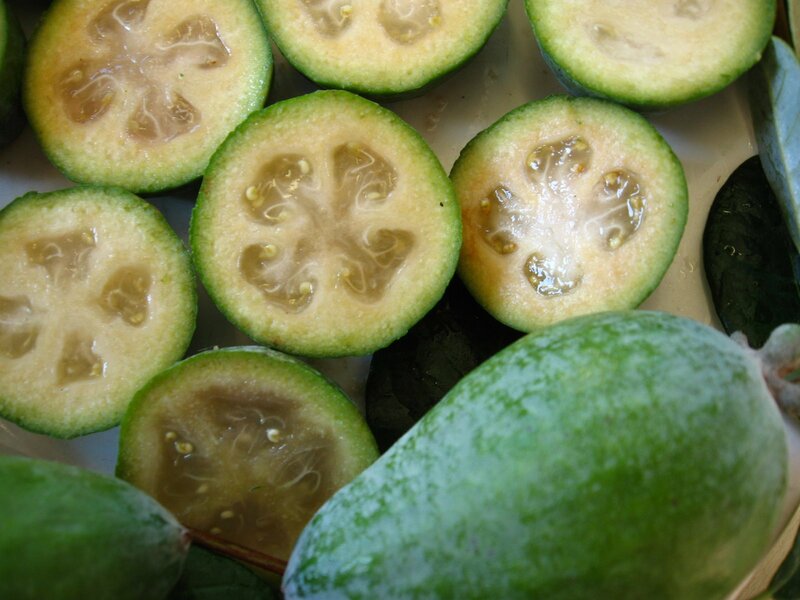 Oh, they judge.”) Last night, we also learned about the Feijoa: A fruit that boldly claims to be like none other. Since the feijoa are out of season we won’t get to sample. But I’m continually surprised by the sheer number of fruits that I’ve never heard of. Last week, Brooke discovered and fell in love with the Tamarillo. A tart citrus fruit with the essence of a tomato. Unique, no? We managed to see a little bit more of Auckland on our last day including stumbling across an adorable shop called The Garden Party in the Ponsonby section of town. We limited our purchase to an Andy Warhol styled Sheep Coaster set (trust me, they’re awesome. Come to our new place for drinks and we’ll break them out) but the store had some endlessly great gear. We ordered one last Long Black coffee at one last café, sent a few postcards, and I even found a respectable enough looking barber to give me a much needed haircut. Our last day to-do list included wanting to try a Meat Pie for lunch which, despite it’s off putting name, is a much beloved local favorite. No stranger sounding than a Sloppy Joe, I suppose. We weren’t able to make that happen, but we’ve added it to our next time list. Our to do list for when we return to New Zealand is getting longer by the hour! 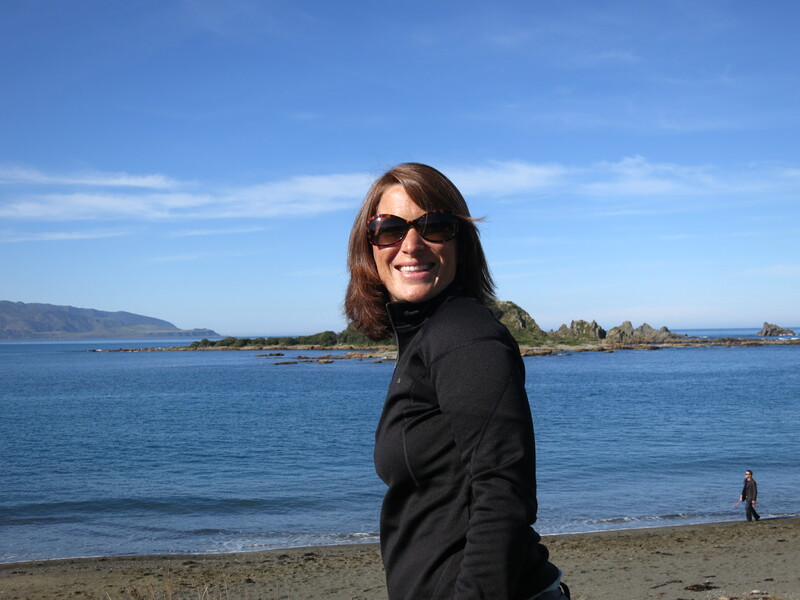 We have a whole Southern Island to explore! I think one thing I’ll remember most about New Zealand is the roads. We’ve been told that an old Kiwi joke is that road builders here get paid not by the mile of road they lay down, but the number of curves they install. Every day outside of the cities is a bit of adventure driving. Yesterday, we came across the commonly seen sign for “falling rock ahead.” Less than a mile down the road, we nearly plowed into a giant friggin’ boulder the size of a small Honda Civic. The mammoth rock was firmly situated about a third of the way into the road. Yikes. Also, in driving over 1,200 KM we saw a singular Kiwi Bird Crossing sign. Ah, I should have taken a picture of that one. Moving forward, my stress dreams may consist of riding around curvy mountain hills that you can’t see around, only to discover a double-long logging truck barreling down the other side of the two-lane road with 300 foot drop-offs. 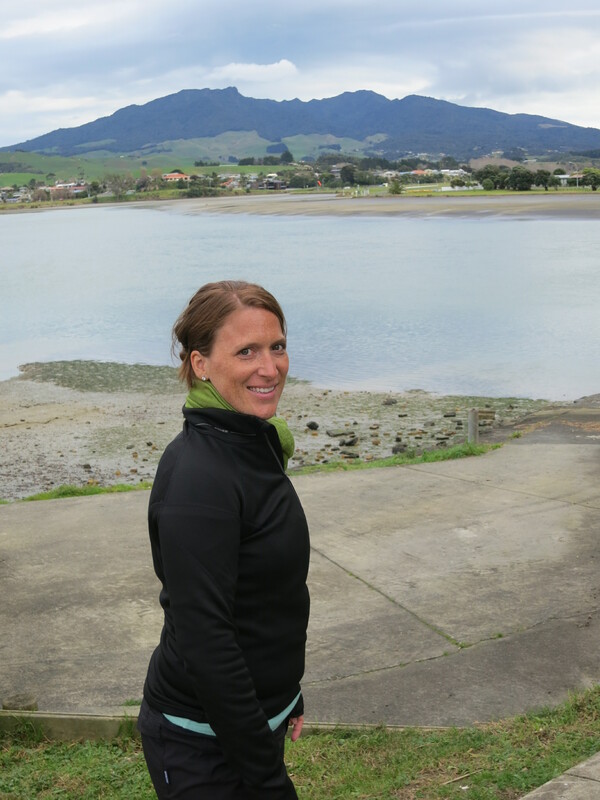 In our next post, Brooke and I will share our favorite moments from New Zealand. 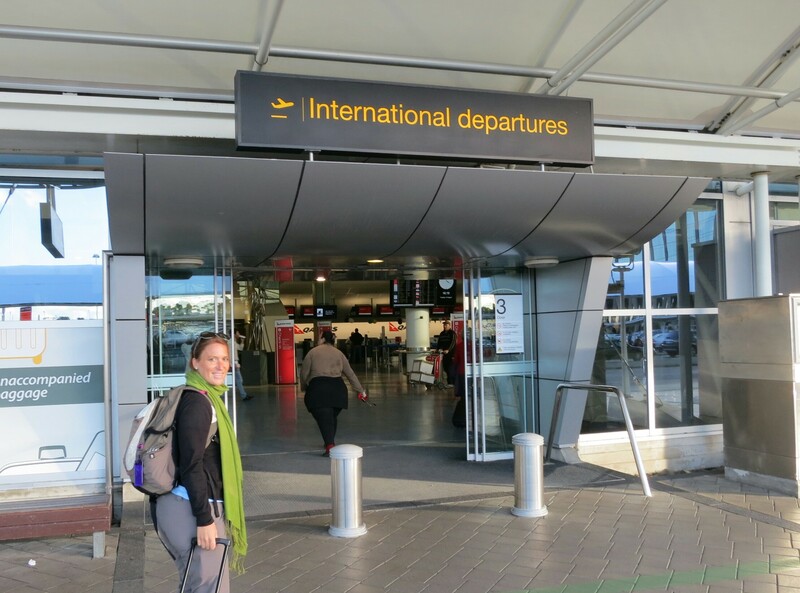 But for now, Vela has been returned to the Spaceport, we’re at the Auckland International Aiport well in advance of our flight and will board our China Southern flight back to Guangzhou and then to Tokyo, Japan. Brooke and I are looking forward to our path to Tokyo and our stay at Camp Zama tomorrow. Next stop: The land of the rising sun! Onward to new discoveries and new adventures. We knew it would happen. It was bound to happen. We figured, Japan, China, Vietnam–any place where the food was strange and the menus are in another language. But no. 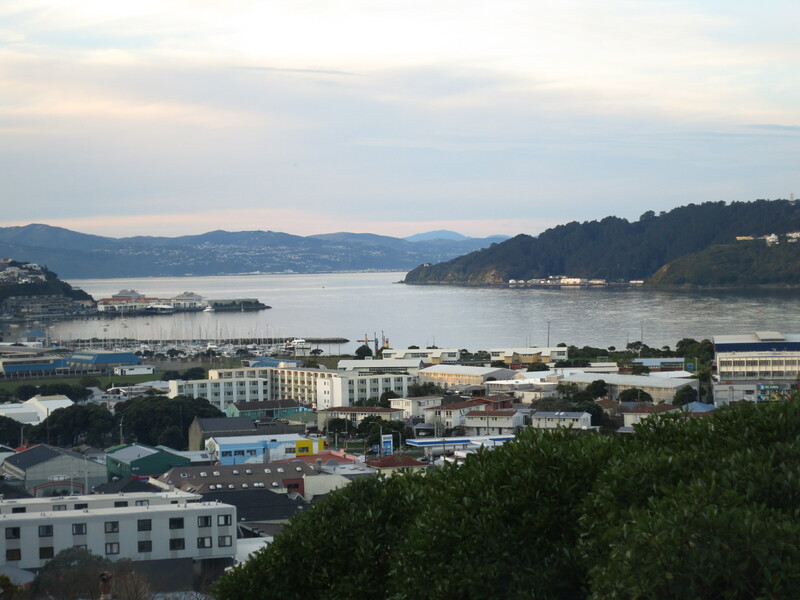 It happened here in safe, English speaking New Zealand–food poisoning! After a rough night of sleep, Phil woke up feeling a little off kilter, which led to feeling awful as he “vommed” up the dinner from last night. We didn’t go to some shady restaurant or anything. This place was very highly rated on Trip Advisor. And to be fair, the dinner was lovely, it was just the aftermath that left a little something to be desired. We considered blaming Phil’s Aunt Joanne, who wanted to know if he had tried the lamb in New Zealand yet. So, he ordered lamb. Everyone can guess how that worked out. I actually blame Phil, who touted cute pictures of lambs laying lazily in the fields as we drove through the countryside, then turned his back on them by eating lamb for dinner. It is a bit of cosmic revenge, wouldn’t you agree? Whoever is to blame, let’s just say it was a bit of a rough day for Phil, which is really too bad because it was a gorgeous, spring-like day here in Wellington. 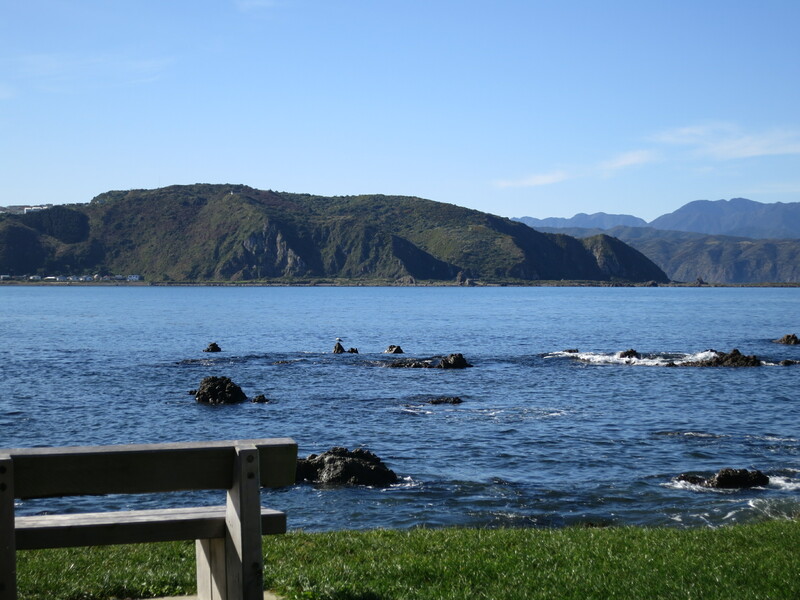 Once we got Phil up and on his feet, we decided to take a drive along the Wellington coastline. 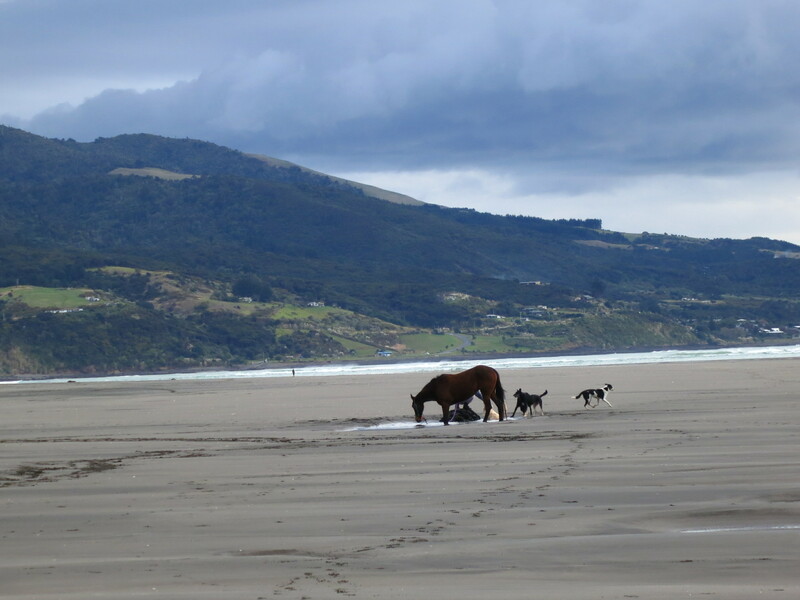 It is absolutely beautiful, with waves crashing against the shore, native birds swooping over the beach and people coming out in droves to enjoy the sunshine and uncharacteristically mild August day. As we wound our way around the coast, we saw a sign for a penguin crossing! How cool would it have been to see penguins! Sadly, it was not meant to be. 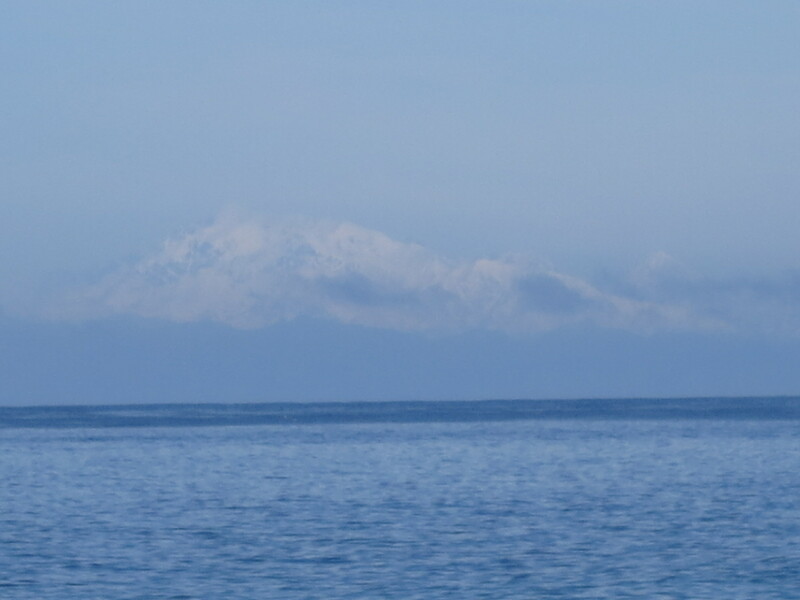 However, we were able to glimpse the snow-capped mountains of the South Island as we looked out across Cook Strait. Just seeing them made us even more sad we won’t be able to make it there on this trip. Next time, I suppose. What has been really great about today is getting to spend time with our lovely Air BnB hosts, Sara and Danny. Knowing Phil wasn’t feeling up to par, Danny insisted we join them for a homemade dinner that “wouldn’t poison us.” We sat on the deck, drinking wine and watching the sunset, as Danny cooked up a delicious dinner on the barbecue. We talked about lots of cultural reference points regarding both America and New Zealand. We were discussing all that we learned on our trip to the museum yesterday, when Sara brought up Danny’s film “Rage.” Danny Mulheron is a director, actor and teacher at the Film Institute and he made a truly engrossing film about the 1981 Springbok Tour. Never heard of it? I hadn’t either until I visited New Zealand. It is the fascinating story of the South African rugby team’s visit to New Zealand in 1981. Because South Africa engaged in apartheid, the Maori rugby players were not allowed to play against the Springbok when they played in South Africa. Now that the team was visiting New Zealand, many citizens refused to stand by and support their racist policies. The civil unrest that followed is fascinating and Danny captured it well on film. We watched the movie alongside Danny and found it to be a very unique experience to screen a film with the director. We have a lot more insight into his choices, the actors and the history of the story. In short, we had an awesome evening! 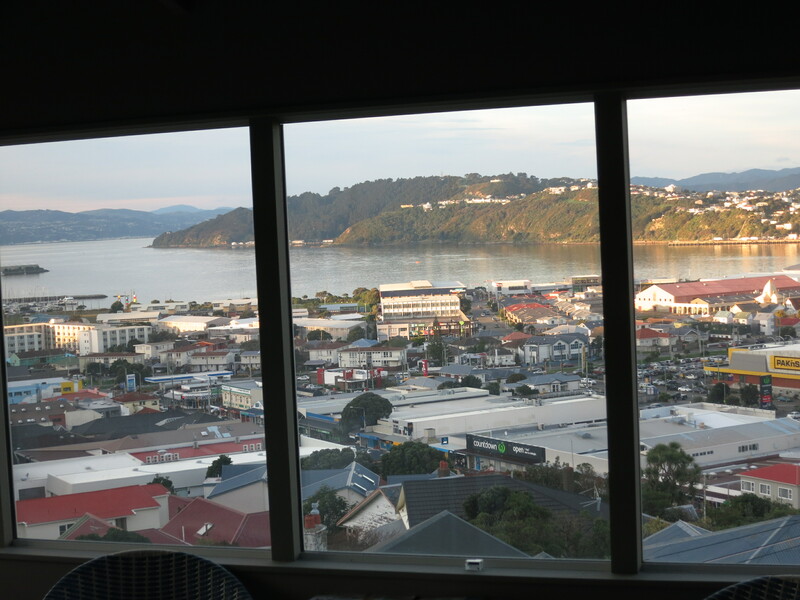 Sadly, it seems our time in Wellington is winding down, as is our time in New Zealand. Tomorrow, we begin the journey back north to Auckland. We won’t make the drive all the way in one day, as it is rather far and don’t want to spend the whole day in the car. We are just glad that Phil is feeling back to himself and we won’t have to change the name of our spaceship from “Vela” to “Vomit Comet”! Even though we’re only a few days in, our time in New Zealand continues to be as wonderful as the sites have been breathtaking. 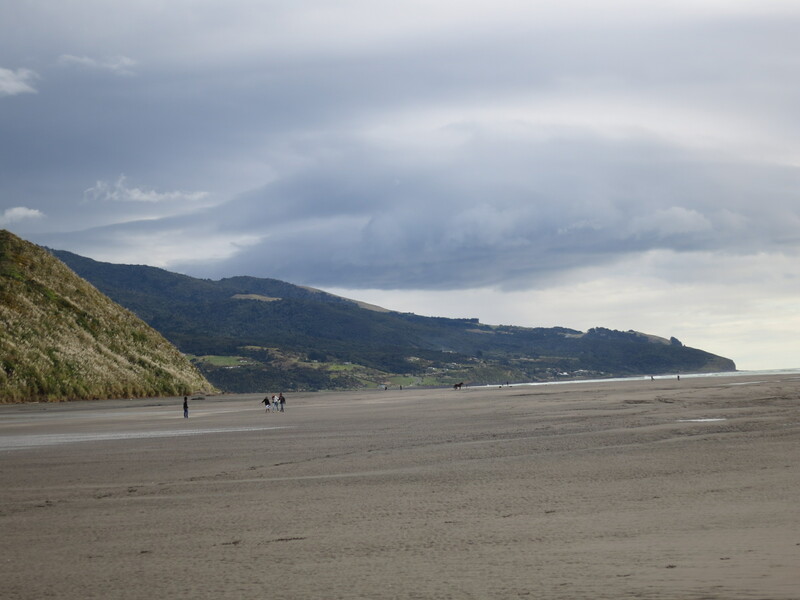 We’re quickly learning that this is a country of boundless natural beauty. Without hyperbole, this land is simply stunning. We had an opportunity to see a good portion of it first hand today. 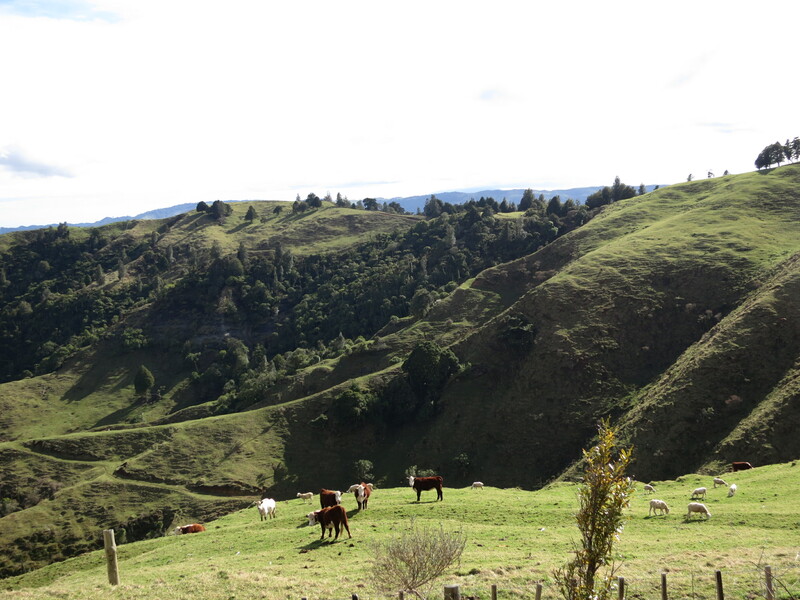 Our third full day here was made up of a trip to scenic falls, a windy drive, a guided tour through the spectacular and legendary Waitomo glow worm caves and an evening with the most hospitable and welcoming couple in New Zealand, if not the Southern Hemisphere. 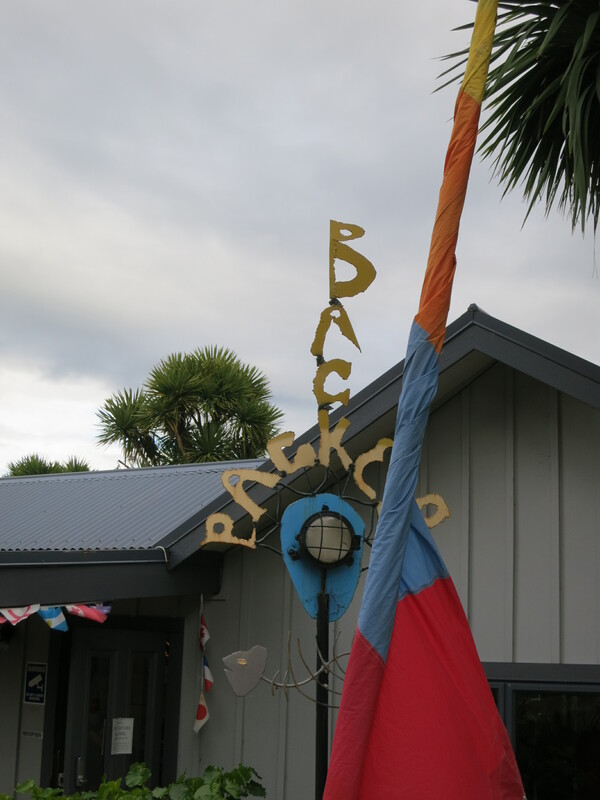 We left Raglan bright and early after completing our recent routine of “Breakfast and Wi-fi” at a local cafe. The locals were celebrating The Chiefs big rugby win last night. We’re also picking up on the friendly rivalry between New Zealanders and their nearest neighbors in Australia who are just “across the ditch” (the span of ocean separating the two countries). Every Kiwi we’ve spoken with has beamed with pride when they remark that New Zealand is 14th overall in the 2012 Olympic medal count while those Aussies only have a single gold medal to their name. Funny. One note on internet access: Every single business we’ve encountered so far is a bit peculiar about their Wi-Fi. No one has true “free” Wi-Fi. With any purchase, you receive a code that gets you online for a set amount of data (50 mb) or time (1 hour). This is a bit hard to get used to. 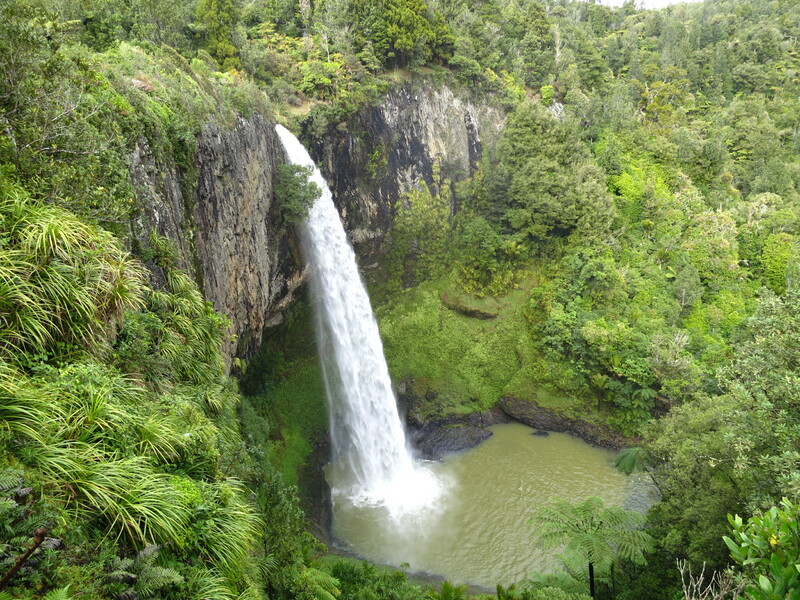 From Raglan, we drove a short distance to the scenic Bridal Veil Falls. After a short voyage down a windy road (oh, have we driven on some windy roads far) and an easy 10 minute hike, we were greeted with the amazing site of water streaming 150 feet to the small limestone pool below. Quite the way to start a day of travel and siteseeing. Amazing. Less amazing was the twisting, slow-going gravel road that we then had to drive on for about 45 minutes. Were we lost? Did we take the wrong road? No, that’s just the way the path goes. White knuckle, can’t-see-around-the-next-corner driving indeed. A challenging, but interesting drive. And as bonus, there were picturesque sheep and friendly cows alongside the road to greet us. And we had the enjoyably music coming from New Zealand radio. Worth mentioning that the “Pop Hits of Today” in New Zealand are pretty much the same as the “Pop Hits of Today” in the United States. Maroon 5, Gotye, Katy Perry, and Fun. have all graced the spaceship’s radio to say hello.Our spaceship wound its way up and down hills and around small mountains as part of an incredibly scenic drive. Around each corner was another bucolic, green and sensational view. I’ve really never seen anything like it. 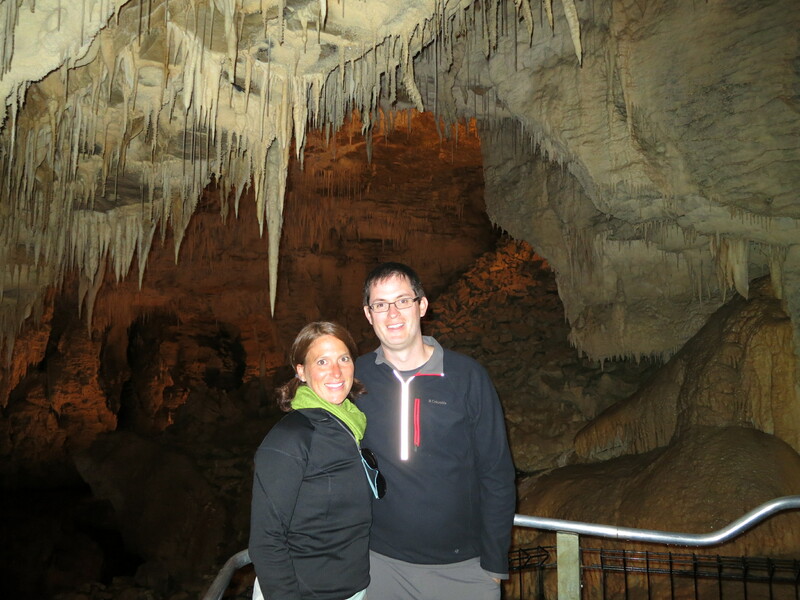 The Waitomo caves, the highlight of our day, was another experience all together. 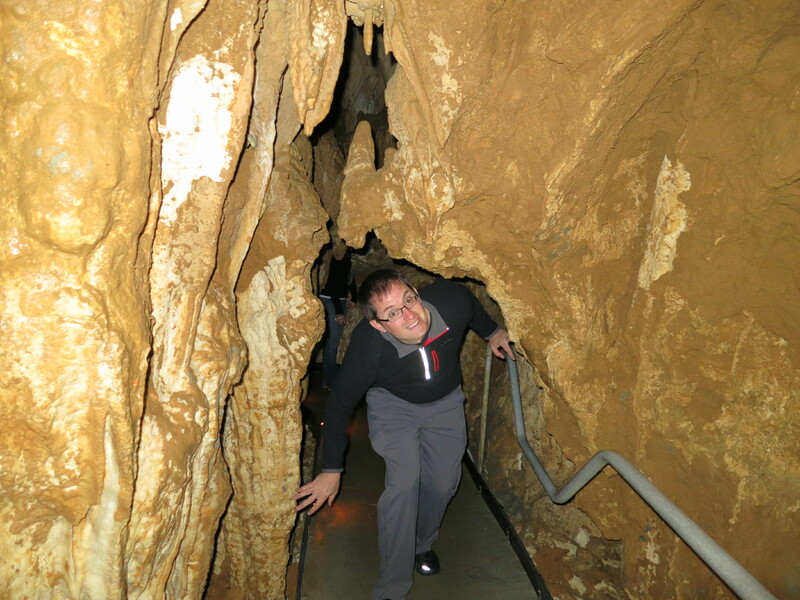 We paid for a combo ticket to visit two caves- Rakauri and Glowworm Caves. The Rakauri cave was a long tour through a twisting, beautiful set of caverns full of stalagmites (coming from the ground that “mite” touch the ceiling), stalagtites, columns, curtains, and more. We had an exceptional tour guide who made the experience outstanding. The magnificent underground beauty was stunning and we learned about the Maori history, background on the caves and just some stunning insight. They even showcase a big chunk of limestone rock that had been carved like a sculpture by just seven years of water drips. But the best part were the glowworms. Native only to New Zealand, these caves are inhabited by glowworms – tiny creatures no longer than four centimeters long that cling to the ceiling and light up the pitch-dark caves like some type of underground constellation. Just…wow. The boat ride at the end of the Glowworm cave through an underground lake was simply amazing and made our day. I could gush for pages about these two caves and the remarkable site of the glowworms. Our evening, spent in Hamilton, was a completely different experience. Against all odds, we managed to meet and befriend possibly the nicest, most generous couple in the country. We met Ken and Marinota during our layover in Guagzhou where they had invited us to their place for tea (dinner) one night. Man, are we glad we took them up on that invitation! What followed was an evening of conversation, meals and never-ending hospitality from this enthusiastic, sincerely friendly,well-traveled duo. 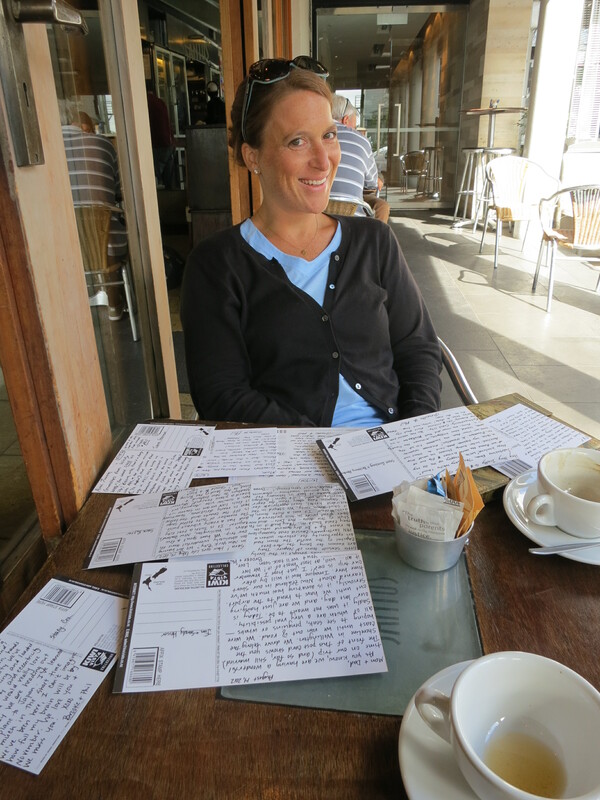 They helped us outline some future stops in New Zealand (each place was more of a “can’t miss’ than the one before! 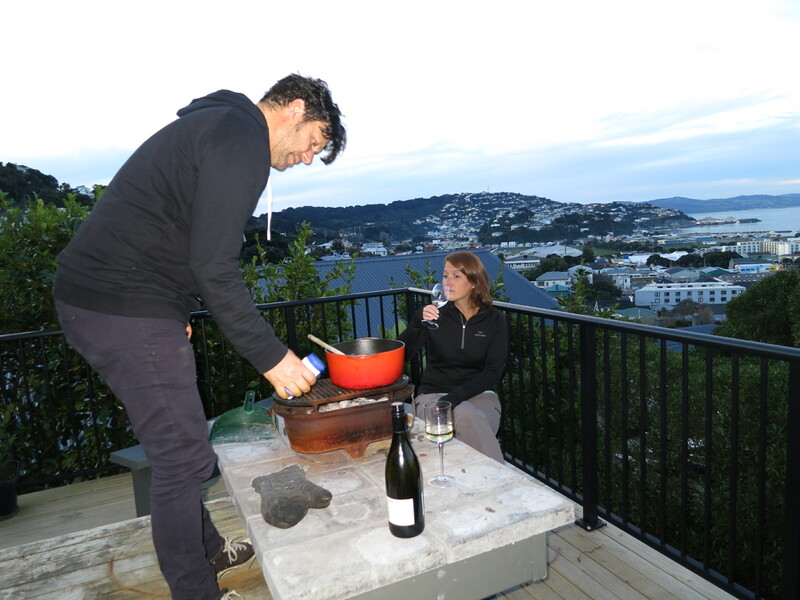 ), talked travel, gave us insight into New Zealand culture (Ken calls the remote “the zonker”) and we even chatted it up with the neighbors – Jason and Felicity – who stopped by. Jason and Felicity are planning a trip to Van Wert, Ohio in December. Where? I thought I knew all the towns in Ohio! I’ve come 7,500 miles just to learn about a town in my own backyard I’ve never heard of. We had an amazingly fun night that left us exhausted (but that might have been the many glasses of wine.) Ken and Marinota, being the wonderful people that they are, even opened up their home to us and invited us to spend the night in the guestroom. As we said, exceptionally generous and absurdly gracious. Hooray for making new friends in New Zealand. 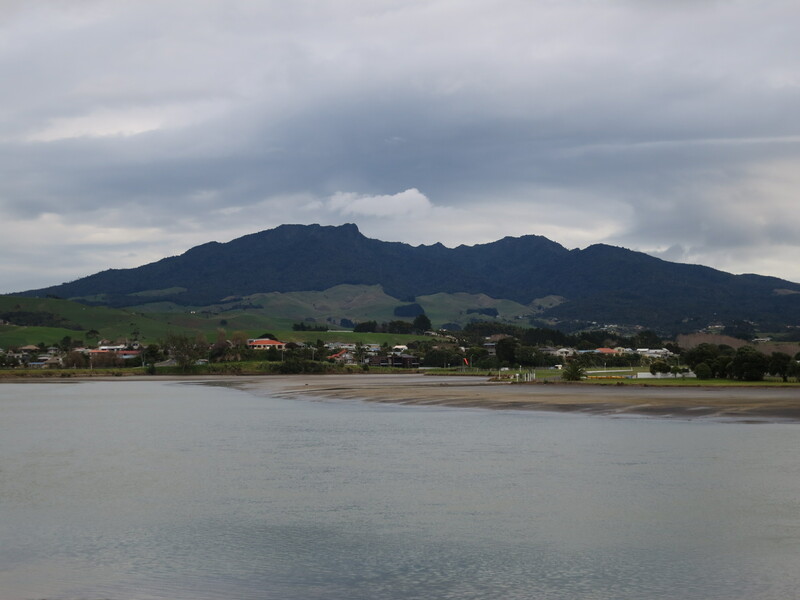 Next, we had west to the town of Rotorua and onward! We know that when you think of a trip around the world, you don’t think of Los Angeles. However, our good friends at the Delta Skyteam think differently. So, in order to embark on our journey to Auckland, New Zealand, we have found ourselves spending the first day of our journey in LA. And let me tell you, we have had such a great day. We are fortunate enough to have some good friends who live here, so we were able to spend our last day in the U.S. with them. We started out spending time with Paula, a friend of Phil’s from back in Atlanta. She and her 3 year old daughter gave up their day and drove all over showing us some of the great things about the city. 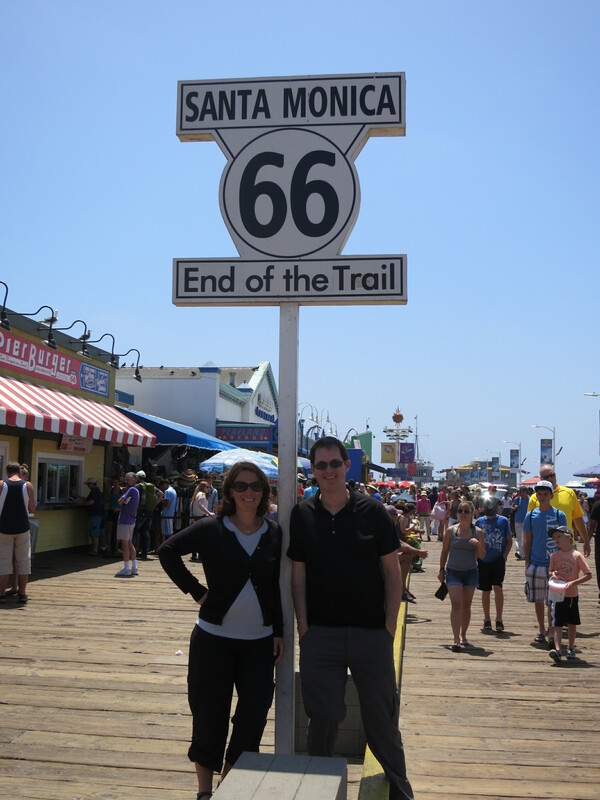 We first went to the beach in Santa Monica, famous for its beautiful white sand, “muscle beach” workout area, and of course, The Pier. We walked along, spying different people trying to one-up each other in all kinds of feats of strength. Phil tried his hand at rope-climbing, but it just wasn’t the same as it was in 5th grade P.E. class. Sadly, a 10 year old girl quickly put him to shame. I certainly would not have done any better and give him credit for trying. 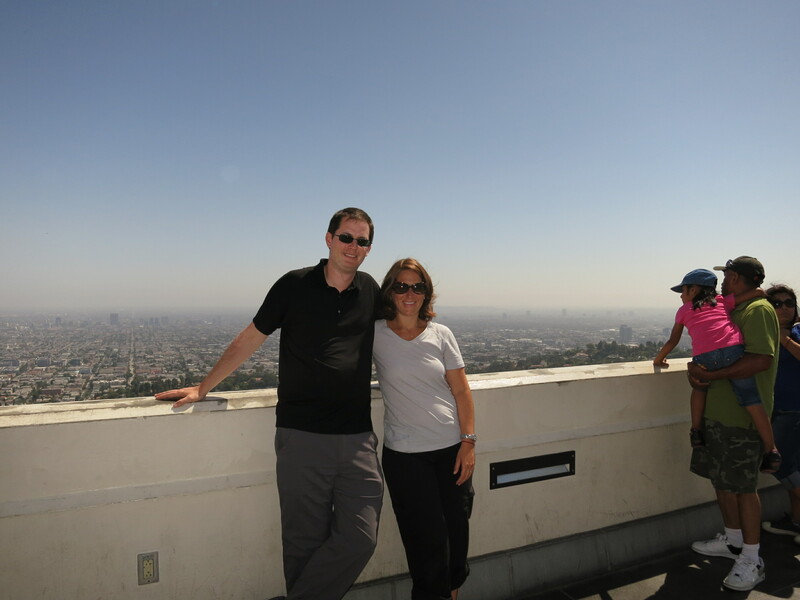 After the beach, we journeyed to the other side of LA, through the notorious LA traffic, up into the Hollywood hills to the Griffith Observatory. Situated in the shadow of the Hollywood sign, the observatory is a lovely spot to get an amazing view of the whole city. True, much of it is blurred by smog, but it is still really beautiful and I can imagine it is a great place to go to get away from the crowds below. It is surrounded by winding hiking trails of varying difficulty which look like they would be a lot of fun if we were here for more time. After our time with Paula, we met up with Murph (Mike Murphy), our friend who works on the NBC sitcom Whitney. Since they are not yet in production, he had the time to show us around the lot where they write and shoot the show, as well as many other shows. This kind of thing is old hat for Murph, but Phil and I got a real kick out of seeing the studio where they shot Seinfeld, Christina Applegate’s parking spot and the outside walls of the Big Brother house. We even got a little homesick walking down “New York Street,” the place on the lot they use for outside shots on shows which are set in New York. Finally, we were joined by two more friends, Frank and Jaclyn, for a delicious sushi dinner at Katsuya–Murph and Frank’s favorite sushi restaurant. We spent our last few hours before heading to the airport with good food, good friends, and great conversation. All in all, today has been the perfect start for our trip!